Grower has success controlling Botrytis with Astun fungicide. This past fall and winter produced great conditions for the development of botrytis on greenhouse crops. Based on information from OHP and others, and an application last spring, Jim Stepp, production manager at Van Wingerden International, decided to apply Astun™ Ornamental Fungicide to more crops. Last fall, Jim used Astun to prevent botrytis on VWI’s finished cyclamen program. “Our cyclamen were very clean even in some very wet, cloudy weather. There was no damage to open flowers. We used a spreader sticker and had no visible residue on the cyclamen flower,” he says. 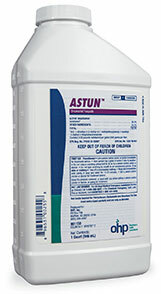 Contact your local OHP regional sales manager for more information on Astun fungicide. Click here for current state registrations, label, SDS and product information.